Originally Submitted to FurAffinity.net on August 13th, 2014 04:02 AM. Before it was transferred to Inkbunny it had 904 views and 235 favorites. What else are friends for? 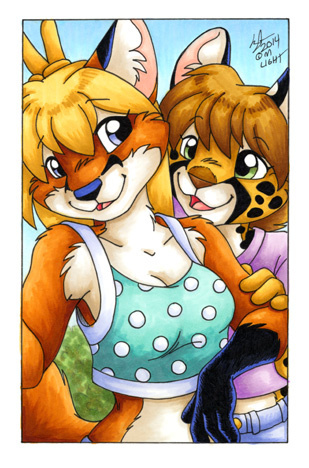 Seems this serval thinks her friend needs more spots in her selfie. Original artwork for this piece will be available at Eurofurence 2014, and prints will be available online once I return.